Outstanding spring color that is bright yellow-orange with rusty margins on the leaf. Brighter than 'Katsura'. Stays bright for more than a month before becoming a bright green for summer. Fall brings colors of orange and yellows. 16ft. Picture shown is of spring color. Best in morning sun and afternoon shade since it will burn in the hot afternoon sun. Zone 5 with protection from winter winds. Vertrees states that it is the same a 'Ueno Yama'. I find this not so since they don't have the same growth habit. 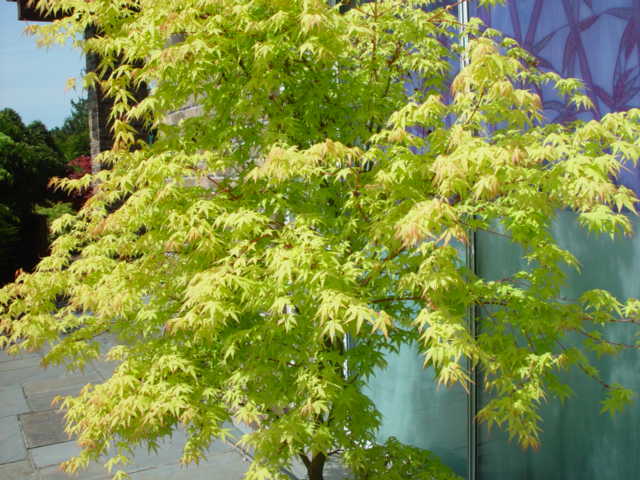 'Ueno Homare' has an upright, rounded form and very fast growing. 'Ueno Yama' grows slower creating an upright, vase shape.